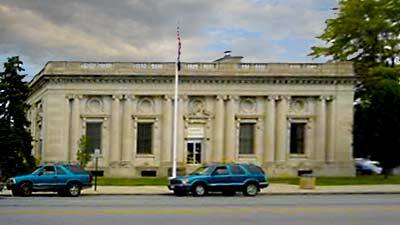 Tiffin is the county seat for Seneca County. 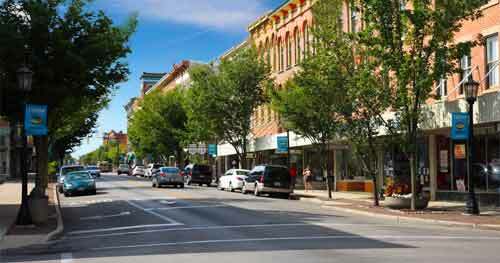 Like much of Ohio, the town was built upon the rich traditions of Virginia and German descendants. Many of the older homes found in Tiffin today were made from brick created by an early brick-making machine that had been invented there. Some interesting firsts for the city of Tiffin was the first in Ohio to have an electric power plant and only the third in the country. St. Paul's United Methodist Church in Tiffin is the first church building in the world to be wired for electricity during its construction. Thomas Edison heard about the builders forward-thinking and presented them with a beautiful brass chandelier which lights the church today. At one time Tiffin was noted as a glass and porcelain manufacturing center. Today, Tiffin glass is a favorite of collectors and is displayed in Tiffin's Glass Museum, glass shows and fine homes across the country. The new American Civil War Museum of Ohio opened to the public in early 2011. The museum has over 10,000 square feet of exhibit, research, and presentation space with 8 main exhibit areas. There is an admission charge with discounts to seniors and military members. In 1888 the A.J.Beatty & Sons glass factory of Steubenville relocated to Tiffin. The glass factory had been searching for a new location for their factory when the city of Tiffin offered them 5 years of natural glass, $35,000 in cash, and land valued at $15,000. Four years later the company merged with the United States Glass Company making the Tiffin plant one of 19 factories. During the depression many of the glass plants in the United States closed. The Tiffin plan was the exception. In 1966 the company was sold to the Continental Can Company and the glass company was renamed Tiffin Glass Company, Inc. The Tiffin factory furnished a variety of stem ware styles and patterns to for private distribution. Among these companies were Tiffany's, Macy's, Colony House, Royal Medallion, Nancy Prentiss, American Manor, and Reynolds Crystal. In 1980, after several ownership changes, the furnaces were permanently shut down and the molds were sold. Today, original Tiffin glass has become a popular collector's item and there is a Tiffin glass museum that honors the heritage established by the men and women of the Tiffin Glass. The museum provides preservation of work from 1889 until the closing. The Ritz first opened in 1928 to a packed house, the Ritz Theatre was designed (built by Dan Kerwin and Adam Ritzler) specifically as a movie house but also included vaudeville shows that were extremely popular at this time. The Italian Renaissance motif makes it look more like a European opera house. The Ritz theatre offers very intimate accommodations for guests with seating in the upper balcony only 100' from the stage. The theatre went through a complete restoration in 1998 to its original design. Ritz Players is an award winning community theatre organization that not only presents high-quality performances at the theatre, but also are involved in workshops and outreach programs. They have been active in the community since 1983. First Friday features 2 - 3 entertainers on the first Friday of every month. 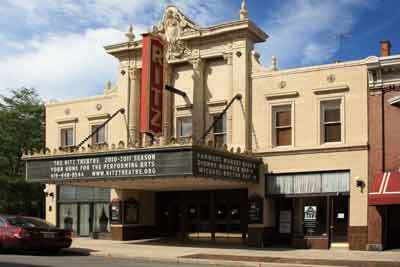 Entertains come from around the region and they may include folk singers, a jazz musicians, or perhaps an aspiring singer/songwriter that are passionate to display their craft in the beautiful Ritz Theatre. 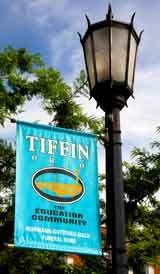 Tiffin is often referred to as "The Education Community" with a college, a university and numerous trade, technical and vocational schools. 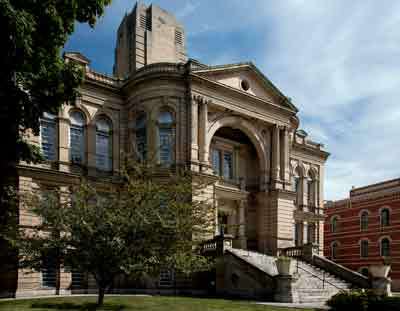 Two large universities include Heidelberg and Tiffin. Heidelberg University has a long and storied history that begins with its founding in 1850 by the German Reformed Church. During this time period, there was a large population of German immigrants and like many institutions of higher learning at the time, religious groups felt the need to create schools where their churches could send their young people. When it first opened, the school was called Heidelberg College, although there were only 5 students and they met in rented rooms. 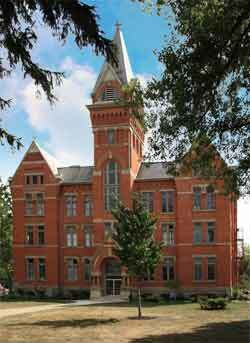 The first building was completed in 1853 and in 1890 Heidelberg College became Heidelberg University. Today, the Heidelberg campus is located on 110 acres and is affiliated with the United Church of Christ. Ten of the buildings on campus have been placed on the National Register of Historic Places. 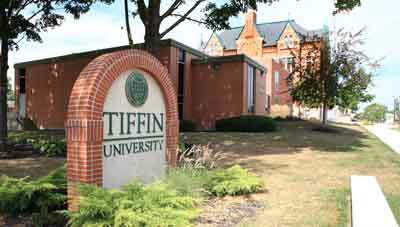 The other university in town is Tiffin University which was originally was part of Heidelberg College serving as Heidelberg's business school. It was founded in 1888. Today the university is a private, coeducational on a 110 acre campus within the city. 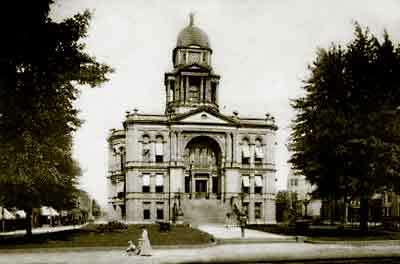 Built in 1884, the county courthouse was one of Ohio's more unusual courthouses. It was designed by Elijah Myers who had also designed several state capitol buildings. The building that was torn down in January 2012, was not exactly as it was designed. In fact, in the 1940s, the central tower was drastically changed to help support America's war effort. The domed top was made of iron and in need of repair. It was decided the best thing was to scrap the domed roof, statue and columns. 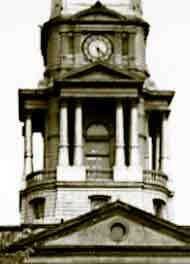 In its place a contemporary structure with a new clock was installed that also allowed for an elevator to be added to the court house. At the time of this renovation, it must have felt like they were modernizing their 19th Century building to better represent the needs of the 20th Century. Instead the two styles, while appear quite unique, condemned the building to its ultimate neglect and demise. County and state budgetary problems made in difficult to justify spending the necessary funds to properly maintain or repair the building, but did have enough funding to tear down the 128 year old structure. During demolition of the courthouse, a time capsule was partially destroyed during the excavation. Most of the contents were saved and are scheduled to be put on display in the Seneca County Museum. The copper box that held the contents was severely mangled. Items inside the copper box included a copy of Lang's History of Seneca County, a Grand Army of the Republic ribbon, several hand flyers for the 1883 Seneca County Fair, a hand-written letter from the Presbyterian Church of Tiffin, an offical Tiffin Directory, a copy of the 1884 Masonic Calendar, some coins, a copy of the Seneca Advertiser, an 1884 copy of the Family Almanac as well as some business advertisements from local suppliers. Born in England in 1766 Edward and his parents came to America in 1783. In 1798 he moved along with his brother-in-law Thomas Worthington, to Chillicothe. Worthington and Tiffin spearheaded the movement to make Ohio the 17th state in 1803. Tiffin was reelected as governor in 1805 and remained in that office until 1807 when he became a US Senator. During the War of 1812, Tiffin was largely responsible for removing records from Washington DC before the British burned the city. After the war, he became Surveyor General of the Northwest which allowed him to return to Ohio until his death in 1829.